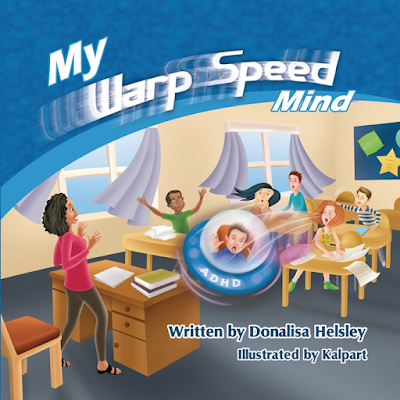 My Warp Speed Mind by Donalisa Helsley is a book which uses the analogy of a fast moving space ship to explain how the mind of a child with ADHD works. Drake is the hero of the book and it is the workings of his mind which is likened to being in a space ship which is constantly moving around at warp speed. Donalisa Helsley explains very well through Drake's experiences that this space ship can be slowed down and brought under control. It reassures the reader that a child with ADHD is not a naughty child, but that some of the behavioral issues are a result of not being able to focus on a single thought at a time. This book does a great job of explaining Drake's challenges in a way that is easy for kids and adults to understand. My Warp Speed Mind is a great resource for kids with ADHD and for their classmates, so they can appreciate the daily trials of a child with ADHD. As the parent of a child with ADHD, My Warp Speed Mind has proven to be useful for all of our family. It showed my daughter that there are other kids out there with ADHD and that there are people who understand what she is going through. It helped my wife and I understand what it is like to have a mind that moves so fast that you may not be able to listen to all of the thoughts in your mind, and why it is difficult for our daughter to focus on a single task through to completion. We also learned some coping techniques and how to adjust our expectations to be more realistic when dealing with a child with ADHD. I would recommend My Warp Speed Mind to any family or group that is touched by ADHD. The book is well written, well illustrated and many of the concepts covered have been reinforced by other ADHD professionals that we have met. 5/5 slaps.